“Facebook Moments, the social network’s recently launched photo-sharing app that aims to address the problem of getting friends to send each other the photos they’ve been hoarding on their own phones, is expanding to video. The app received its first major update today since its mid-June debut, and will now automatically create a video of your shared photos which you can customise, personalise and share back to Facebook. 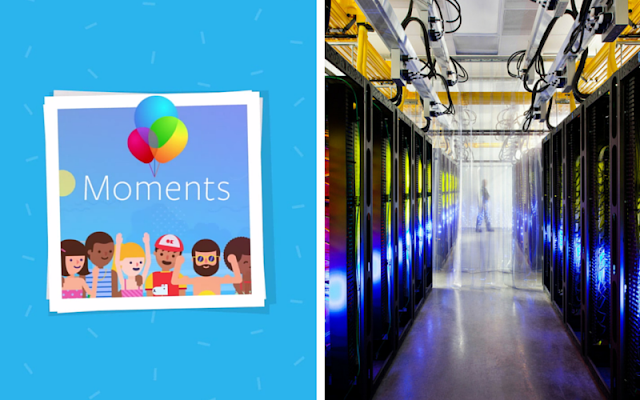 “With the update, Facebook Moments will automatically create a music video for any grouping of six or more photos. You can then tap this video in the app to customise it further by changing the included photos and selecting from about a dozen different background music options. When you’re finished making your optional edits to this video, one more tap will share the video directly to Facebook and tag the friend or friends with whom you’re already sharing those photos. To read the full article, visit TechCrunch. “Google has given everyone a rare look inside its server rooms and detailed how keeps up with the massive growth of its search business. In a blog post, Amin Vadat said that the company’s current network, Jupiter, can deliver a petabit per second of total throughput. That means each of its 100,000 total servers can randomly speak to each other at a speed of 10Gb/s, a hundred times faster than the first-generation network it created in 2005. To get there, Google did something surprising – it built its own hardware from off-the-shelf parts. “Back in 2004, Google decided to stray away from products created by established companies and build its own hardware using off-the-shelf chips from companies like Qualcomm. The aim was to put less onus on the hardware and more on software, something that’s impossible with off-the-shelf switches. Vadat explained that hardware switching is “manual and error prone, and could not scale to meet our needs.” Using software switching was not only cheaper for Google but easier to implement remotely – critical for a company whose bandwidth requirements have doubled every year. To read the full post, visit Google’s Research blog. “As an eager, fresh-faced 19-year-old, I turned up at Google – at the time, a 3,000-person tech company – ready to dive headfirst into anything. Over the next six years, I discovered that the Google lifestyle meant more than just an on-site laundry service and free gourmet meals. I was one of the youngest employees on staff, but nobody held my hand. Within weeks, deadlines, duties, and complex projects began to pile up. I hadn’t even taken a finance class, yet I had two weeks to put together a strategy for entering Africa and Eastern Europe. I had to be resourceful. “As a tech entrepreneur today, that sink-or-swim experience influences nearly every move I make. Here are five of my top takeaways from my time at Google early in my career. To read the full article, visit Fast Company.